Trilogies have a hard time finishing strong. Even unofficial trilogies, where the only connections are the talents involved and a running style, have hits and misses. So it is that The World's End, Edgar Wright's capper to his unofficial Three Flavours Cornetto Trilogy - following Shaun of the Dead and Hot Fuzz - has much to live up to. Wright has yet to let us down, and he isn't about to start. The World's End is smart, loaded with energy, and above all else, simply hilarious, precisely as expected from Wright and writers and stars Simon Pegg and Nick Frost. The other two flavours in the bunch are surely raising their glasses. Or better make that a dozen glasses. Pegg plays Gary King, the former leader of a group of five - Frost, Paddy Considine, Eddie Marsan, and Martin Freeman playing the adults - who, as teenagers, attempted the Golden Mile of their childhood home of Newton Haven. 12 pubs. 12 pints. All in one evening, but as teenagers, the group fell short of completing the beer crawl. Naturally they moved on, grew apart, and made different lives for themselves. Well, all but Gary. He's still living the childhood, carefree and rocking the same, black coat he did before he had regular facial hair. Now, wanting to claim a victory he failed to achieve years before, Gary gets the gang back together, and the five - the other four more than a little reluctant - set their sights on making it all the way to the final bar, The World's End. However, things in their hometown aren't exactly as they remember. People are acting strange, nervous, especially at the sight of the five men returning after years of being away. It isn't long before the guys uncovers a dark secret about the town and the people in it, but despite the Earth-shattering ramifications of what these men are encountering, their pub crawling ways will not be deterred. Of course, when your hometown has been overtaken by artificially intelligent robots, the best way out is through. It isn't difficult to fine the familiar vein that runs throughout Wright's Cornetto Trilogy, the idea of a community turning against a small group who must find a way to survive. 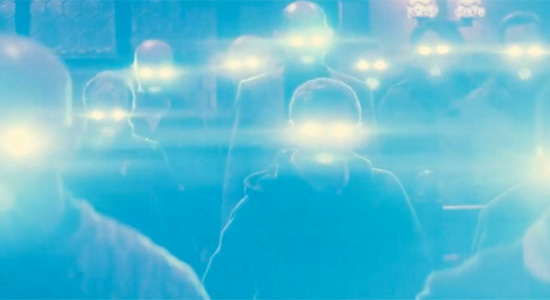 Whether zombies in Shaun of the Dead, a powerful Neighbourhood Watch organization of a small village in Hot Fuzz, or roving bands of artificial beings here, writers Pegg and Frost have always come up with the unexpected to throw at their characters. But just because a shared theme is easily noticed doesn't take away from the film itself. Every one of these films nails the story surrounding that device. The World's End never even threatens to become an exception to that rule. Even with the shared rules and style of humor making themselves evident, the screenwriters and director are always on target with delivering the unexpected. The humor doesn't always come from the direction in which it's anticipated. The arcs of each of these characters, prominently Gary, doesn't move the way you might be expecting it to. The threat in The World's End evolves as the film progresses, as well, culminating in quite an awesome and satisfying resolution that puts a fine period at the end of the Cornetto Trilogy. Once again, Wright shows his strength in directing the humor as well as the action with an abundance of energy. The World's End is never as hyperreal as the director's Scott Pilgrim vs. the World, but that doesn't keep the style he utilizes from fitting in perfectly with the film's sci-fi atmosphere. Just as he handled the horror of Shaun of the Dead and the action of Hot Fuzz with impeccable precision, the paranoia and strange dangers on display in The World's End are right up there with some of the best sci-fi classics. The fight scenes, many that there are, become works of action-packed art, most of them seemingly single shots loaded with right-and-left excitement. 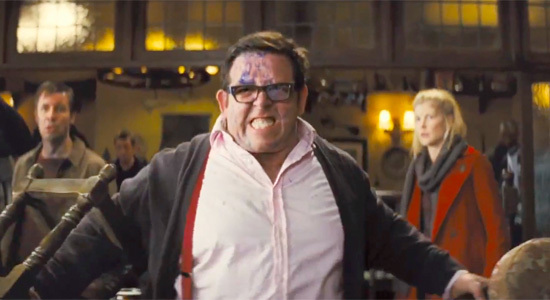 The film is never as violent as Wright's two, previous Cornetto films. There's tons of ink spilt, but not much visible blood at all. This never holds the excitement back. This is an interesting choice given the gory details Wright couldn't wait to show us in the first two films. However, the bloodless nature of it all pushes the strong, '50s-era sci-fi, vibe The World's End seems to wrap itself up in in a monumentally effortless way. And it all syncs beautifully together with the way the five actors play against one another. While Shaun of the Dead and Hot Fuzz had the biggest spotlight shining on the characters Pegg and Frost were playing, The World's End gives equal time to all five actors, each of whom turn on their respective charm with ease. Marsan, Considine, and Freeman are every bit the presence as the two screenwriters, each of them bringing enough character quirk and liveliness to shine through. The same goes for Pegg and Frost, though, the two almost coming across like a comfortably warm blanket here at the end of this trilogy. As with Hot Fuzz, The World's End subsides a bit on the emotional element. Gary and his mates lay their emotional baggage on the bar more than once, but the film seems more concerned with delivering solid thrills and laughs than achieving genuine drama with its characters. There's nothing wrong with that. That's the aspect that pushed Shawn of the Dead into being one of the all-time great horror comedies, but the spot-on humor and the vigor with which it's executed puts The World's End right alongside where it counts. The Three Flavours Cornetto may be as close as we can get to having a perfect trilogy, officially or unofficially, and though The World's End serves as a satisfying stamp to it all, you can't help but hope Wright, Penn, and Frost come up with ideas for a few more flavours. i watched the trilogy showings they did a month ago on the uk release, if you get the chance to watch this way, it is the best way to do so. As for the film, very good, unfortunately i think the wider cast hurts the film a bit and as such it sits as the worst of the trilogy, which is still a fair amount higher than most films. Loved every second of it. Best of the trilogy for me. Absolutely loved it. Every bit. I honestly don't know where I'd rank it in the trilogy, since both of the other films are, like this one, near perfect. Jeremy I dont think you mentioned your thoughts on how they actually connected the CORNETTO part of The Cornetto Trilogy? I loved the fact they saved it till the end and used it in the most unexpected way.... probably because of spoilers.